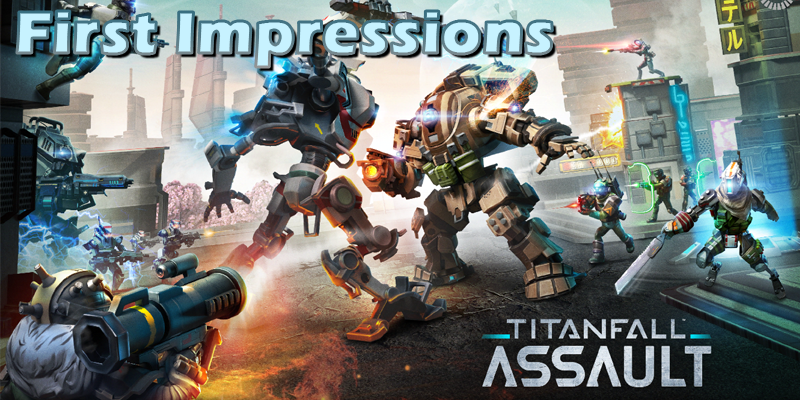 After cancelling a mobile-based Titanfall Card game, Respawn Entertainment announced last week that they would be releasing Titanfall: Assault this week. This version of Titanfall is a top down tactical game, with card collecting elements. Having spent three hours with Assault, it is clear that it tries it's damnedest to recreate the Titanfall world on your phone. It succeeds in some aspects, and fails at others. The crux of the game is a PvP mode where players go head-to-head against each other using customized loadouts that are driven by a deck collected through the ever-present-but-still-crappy micro-transaction system that has plagued mobile gaming for a long while now. Similar to Star Wars: Force Arena, you earn packs that can be unlocked over time, or unlocked right away with a premium currency. What makes Titanfall: Assault different though, is that there are two ways to win a match. Like it's big brother, you can win by holding three hard points on the map until you reach a score of 100. Or if brute force is your preferred method of combat, you can build a deck around destroying your opponents base outright. It is way too early to tell if both of these strategies are viable, but the fact that the different win conditions exist means that you have a lot to pay attention to. Each match lasts 4 minutes, with your Titan cards locked out until the three minute mark. While building a team of expert infantry units and giant robots is cool, none of the customization from Titanfall 2 is present, and the relationship between Pilot and Titan is non-existent here. You just call Titan's down with a flick of a finger, instead of each pilot having their own powerful Titan. While the colorful and awesome looking Titan's grace the main screen of the game, they are completely void of personality, becoming nothing more than bigger units to play with in the arena. Even upgrading your Titans just increases their stats, instead of giving them new moves or a new paint scheme. On top of all of that, the rewards earned at the end of each match are so small that getting your deck to a consistent level will take only the most dedicated of grinds. While this hasn't effected the nearly 10 hour old game quite yet, players that sink cash into the horrible microtransaction system will start out performing the free-to-play players within the next week. When you are in the middle of a match, Titanfall: Assault is fun and exhilarating. Keeping the match length to 4 minutes is perfect, and having multiple ways of winning a match mean there is variety in it's lightning quick gameplay. If only there wasn't a huge grind right out the gate. The starting inventory of cards doesn't give you much to experiment with, and there is no way of knowing what combination of cards will work well together without digging through a ridiculous amount of menus. Hopefully future patches will bring the macro elements of the game in line with a really great tactical experience. Titanfall: Assault is available on iTunes and the Google Play Store.